Jupiter moves across the sky in a very predictable pattern, but every now and then it reverses direction in the sky, making a tiny loop against the background stars – this is Jupiter in retrograde. 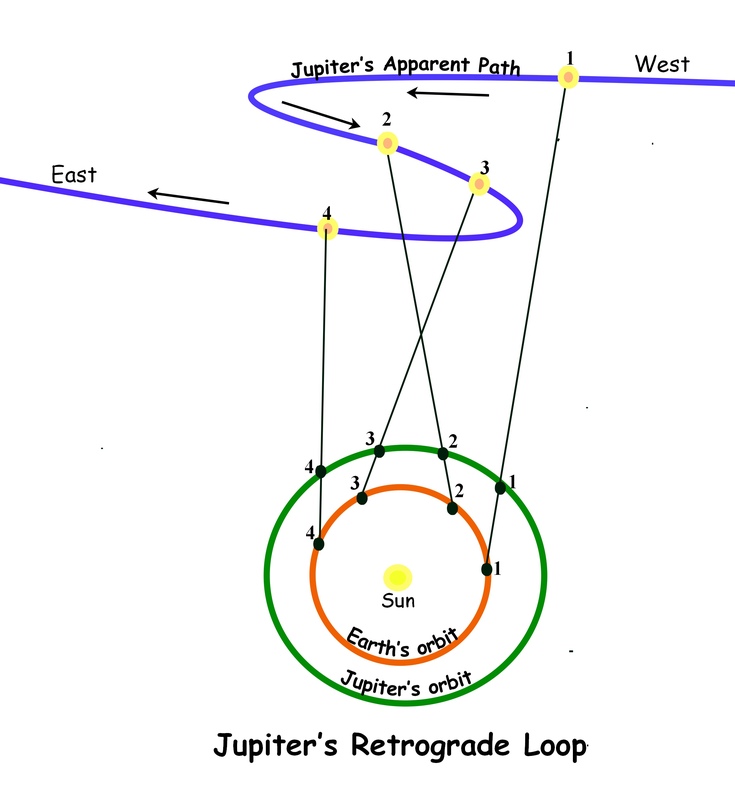 The following diagram shows that, as Jupiter is overtaken by the Earth, its apparent motion across the sky appears to describe a loop as its direction changes from prograde to retrograde and then back to prograde again. At position 1, it appears to be moving from west to east in prograde motion. At positions 2 and 3, its direction appears to have changed from prograde to retrograde so that it is now moving from east to west. At position 4, it appears to have resumed prograde motion as it moves from west to east again. Note. Sky maps can be very confusing because they are not drawn in the conventional way with east on the right and west on the left. They are drawn as they would appear in the sky if we were lying down with our legs pointing to the south and looking upwards so that east would be on our left and west on our right. Jupiter’s retrograde periods last for 4 months and are then followed by periods of nine months of prograde motion before going retrograde again. So the time from the beginning of one retrograde movement to the beginning of the next is approximately 13 months. The relatively slow movement of Jupiter across the sky makes it very easy for the navigator to locate. It appears to move from one constellation to another every 13 months describing its retrograde loop as it pauses in each one. In January 2016, Jupiter will pause in Leo when it goes into retrograde motion and thirteen months later, in February 2017 it will be in Virgo when it begins the sequence again. After that Jupiter is retrograde in Libra in March 2018 and so on as it follows its path through Scorpio, Sagittarius, Capricorn, Aquarius, Pisces, Aries, Taurus, Gemini, Cancer and back to Leo again. Jupiter’s predictable path across the sky together with the fact that it is the fourth brightest celestial body in the sky explains why it is such an important navigational planet. This entry was posted in astro navigation, Astro Navigation Topics, astronomy, celestial navigation, Topics For Schools and tagged astro navigation, astronomy, celestial navigation. Bookmark the permalink.